Seventeen miles of beautiful coastline that links three award-winning contemporary art galleries – Towner Gallery Eastbourne, De La Warr Pavilion and Jerwood Gallery Hastings. The trail celebrates our coastal culture by recommending a visit to all galleries and everything in between. It offers ways of travelling, places to stay, eat, drink and shop, highlights other galleries and events and suggests trails for the active traveller, the family and those who like to take it at a more leisurely pace. You can explore the trail by bicycle or you can travel by train, car or foot! Find out more about sustainable travelling on the trail on Good Journey. Pick up a Coastal Culture Trail Map & Guide from the DLWP shop (£2), to help plan your route and see all the fantastic places you can visit nearby. 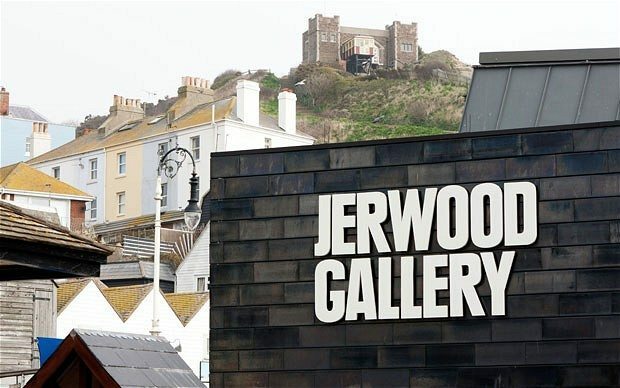 Opened in March 2012, the award-winning Jerwood Gallery sits next to the fishing beach in Hastings’ historic Old Town. The gallery is home to the Jerwood Collection of 20th and 21st century art and a varied temporary exhibition programme showcasing the best of modern and contemporary British art. The De La Warr Pavilion is a pioneering centre for the arts. A place where everyone can experience contemporary exhibitions, events and entertainment in an iconic Modernist building. By the sea, on England’s south coast. We are a vibrant, versatile space in which we aim to cultivate talent, inspire creativity and provide opportunities for interactions between artists and audiences. We provide integrated cultural programmes that are accessible and relevant to the world in which we live. We encourage exploration, collaboration and innovation by providing a venue where artists from different disciplines and audiences can meet, engage and share their thinking and ideas. Offering free access to exhibitions all year round, plus live performances, a dynamic learning and participation programme, indoor and outdoor events, and bespoke venue hire, we aim to live up to the name given to us by our audiences when we first opened – the People’s Pavilion. Towner is an award-winning contemporary art gallery and museum for South East England. The story of Towner dates back to 1920, with the original bequest of 22 paintings by Alderman John Chisholm Towner. The Alderman left these paintings to the people of Eastbourne, with a sum of money to establish “an art gallery for the people”.